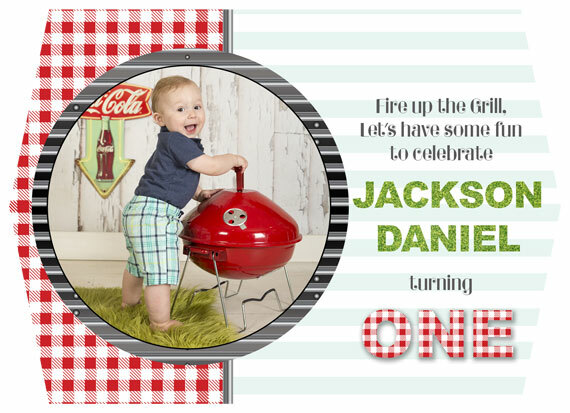 Barbecue theme birthday invitation using checkerboard and metal grill textures. Can be converted to a thank you card, gift tag and more, simply leave details in the notes section! (1) 5x7 high res Digital JPG file of finished card (front and back) to print at home, print at your local printer or email to guests. Upon purchase, a proof will be emailed to you within 48 hours. Changes (color, photos, text, font, etc.) can be made up to three times, afterwards a $10 fee will be charged. *Please note: A professional printer is recommended for die cut edges. A plain rectangle will be emailed to you. LOOKING TO BUY THIS CARD PREPRINTED AND READY TO USE? Card Templates are set up to print with lab of your choice. There are many internet options available that print on card stock, double sided. If printing through CinemashopBoutique (options at checkout), please allow 5-7 days after approval for delivery. Shipping of printed material available to US residents only. Digital JPG images can be emailed internationally for local printing in your country. IN THE CHICAGO AREA AND WANT A MINI PHOTO SHOOT FOR YOUR CARDS OR EVENT?